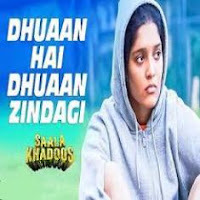 Dhuaan hai Dhuaan song lyrics from the movie Saala Khadoos. Saala khadoos is Tamil version od Irudi Suttru. It’s a sports drama film written and directed by Sudha Kongara and directed by S.Sashikanth. The lead roles of this film are R.Madhavan, Rithika Sing. Kalyani Nair has sung this song (Dhuaan hai Dhuaan) beautifully in the composition of Santosh Narayanan in the lyrics of Swanand Kirkare.